Sage has planned countless weddings in the nine years she has been with Hudson Valley Ceremonies. She works very closely with her couples to coordinate contracts, meetings, supplies and more. She is always more than willing to speak with couples to assist them with their wedding planning questions. Sage has the knowledge and experience that are necessary to plan a flawless event. She understands the importance of pre-wedding planning and organization. There is no idea too large and no detail too meticulous. She also believes nothing is impossible. She will assure a stress-free event, allowing you to be a guest at your own wedding and can turn any vision into a reality. Sage currently resides in Kingston, NY with her husband, Joe and their four children, Austin, Nate, Garrett and Mackenzie. Bob and I can’t thank you enough for helping to organize our daughter’s “simple country wedding”. Without you and your organizational skills, I can’t imagine how this wedding would have happened. I loved the monthly email updates keeping everyone on their toes and how get things planned. I also appreciated how you calmly and efficiently put together a schedule for the wedding. It worked and quite a few guests and the photographer from NYC commented how well run the entire wedding went. The wedding rehearsal at the church was organized by you. You knew who, what, where, and when everyone should be at a certain time. One of the funniest moments was when you were with the bride and bridesmaids as they were getting ready and I needed body cream. Out came your “Mary Poppin’s Purse” filled with everything an emergency would need including the cream. All the girls got a huge kick out of that, but it showed how prepared you were for anything!!! You and your assistant Michael were so organized and answered every question although there were few due to your overseeing the event. When I would see you and your clip board walking around during the reception I could relax and enjoy the party!! Personally, I found your calm, capable manner reassuring as I had never had a daughter get married. I knew I needed help as Boston is a long way from the Catskills. Your company Hudson Valley Ceremonies was just the place to go for guidance. Many thanks for helping make Dave and Eliza’s wedding be such a magical event. We are very grateful to you and Michael. Our day was perfect. Perfect as just we wanted it. Casual but beautiful. Fun yet touching. Rowdy but classic. Boisterous and loving. It was everything we wanted and thanks to you it was completely stress free. You were amazing and the day would not have been what it was without you. You helped us create exactly what we wanted and had day dreamed about without exception or compromise. We cannot thank you enough!!!!! Sage, our planner was amazing and so great and easy to work with. I cannot recommend Hudson Valley ceremonies enough, I have zero complaints. I almost wish I could get married again just to spend more time with her. James & I really just wanted to say Thank You for everything that you did! Not only did our wedding day run 100 times smoother with you there but you were completely amazing throughout the whole planning process. Thank you so much for always being there and for making our day perfect! Thank you so much for your flawless work and amazing support both before and after our wedding. We would have died without you! We had the best day of our lives and you were a huge part in making that happen. Our planner Sage was wonderful, and she did an amazing job for a very reasonable price! 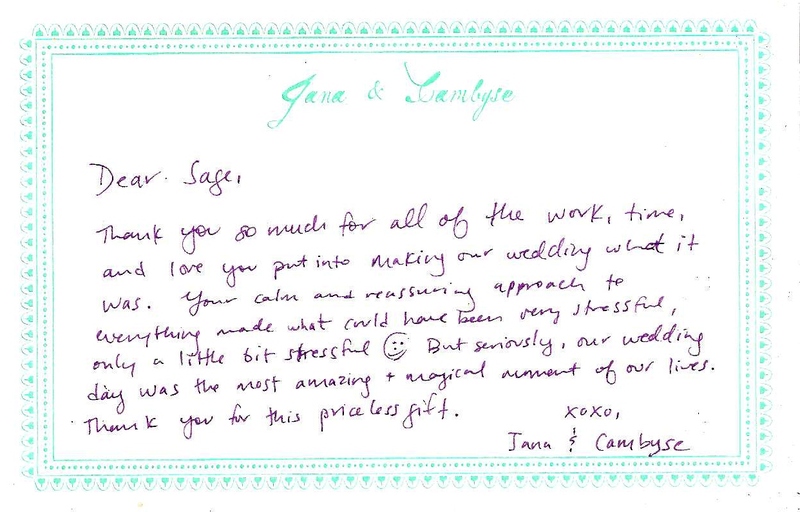 Hired as the day of wedding planner, Sage was fantastic and provided so much that she practically paid for herself. I saved 50% on my invitations and favors ordering through them. They are very knowledgeable and worked at my reception site previously so they were familiar with its staff and procedures. Sage and her assistant were INVALUABLE the day of. We had a walk-through on the site a few days before and then they met me at my hotel at 12:00 noon the day of the wedding and came back to the room with all of the items left over from the reception at 12:00 midnight including heavy boxes of unused alcohol. In between, they helped with pictures, set-up, tips and ceremony. They made sure all 185 guests were accommodated including wheelchair, babies and 3 buses to and from hotel. I highly recommend. You can’t afford not to hire them! A profound and heartfelt thank you for making our wedding so wonderful and from where we stood glitch free 🙂 My mom has recovered faster than expected and Manu and I keep the fondest memories of that day and the planning process 🙂 your the calmest, coolest and most collected planner we could have hoped for!